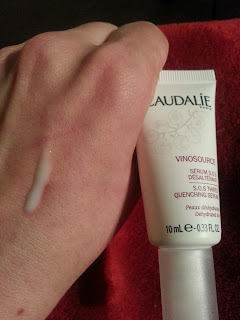 My Boyfriend Hates Makeup: Caudalie - Vinosource: SOS Thirst Quenching Serum: Love it! 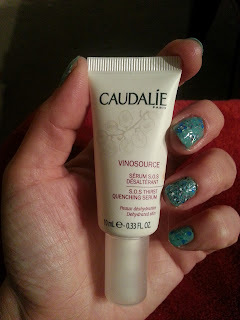 Caudalie - Vinosource: SOS Thirst Quenching Serum: Love it! 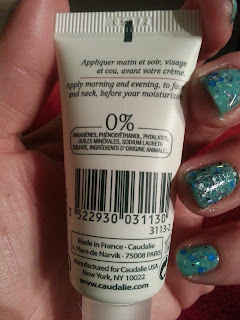 I got this sample from Sephora, I believe it was a 100pt perk or just a promotion by itself. Any time I see a Caudalie product, I know I want to try it! I usually want the full size but they are a little pricey for me to use on a regular basis. This is Vinosource: SOS Thirst Quenching Serum. I love a silky serum. Serums of any kind and primers are my favorite textures in my makeup traincase. I love a primerrrrrr - if anyone has suggestions of primers that ROCK, leave them on my FB page - www.facebook.com/myboyfriendhatesmakeup.com - I will try them ALL!! 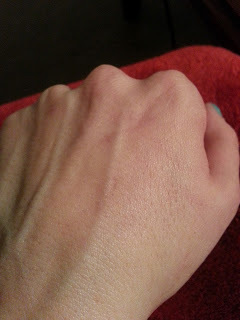 Rubbed in, super silky to the touch! Like all Caudalie products I've tried, this is wonderful. Alone it is moisturizing but not enough for my skin alone. I use a moisturizer over it and it really makes it feel as if the moisturizer has absorbed and sunk in. There is a light, fresh scent, nothing major at all. I happen to have a few other similar samples so I won't be in a rush to purchase a full size anything, but this is pretty lovely! Remember, please visit me on FB and leave primer suggestions if you have a fave! Thanks!